Timothy Gilboe holding the armor plating credited with saving his life, he said it serves as a reminder of his fellow soldier Matthew Hermanson who lost his life in the battle. The armor plating credited with saving Sgt. 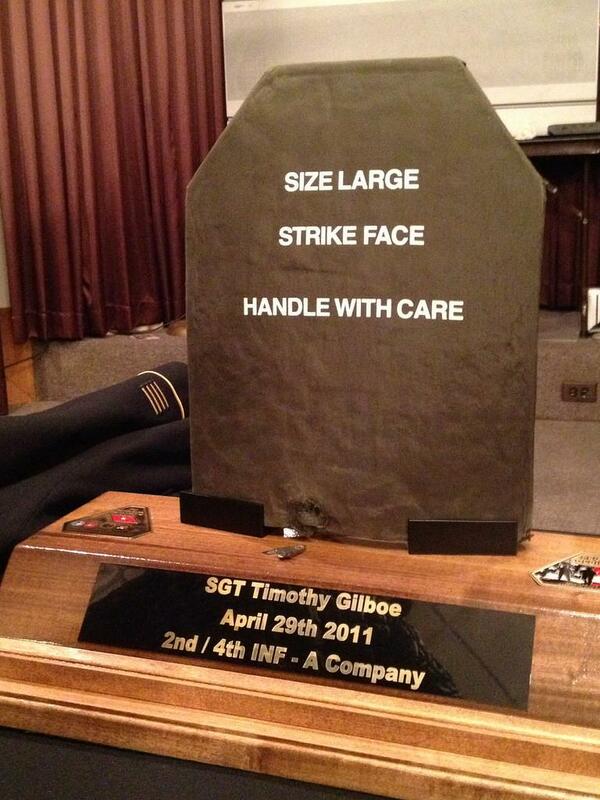 Timothy Gilboe's life turned into a plaque by the U.S. Army. At a ceremony in Portland, a Maine soldier who fought in Afghanistan was reunited with a large piece of metal that saved his life. Sgt. 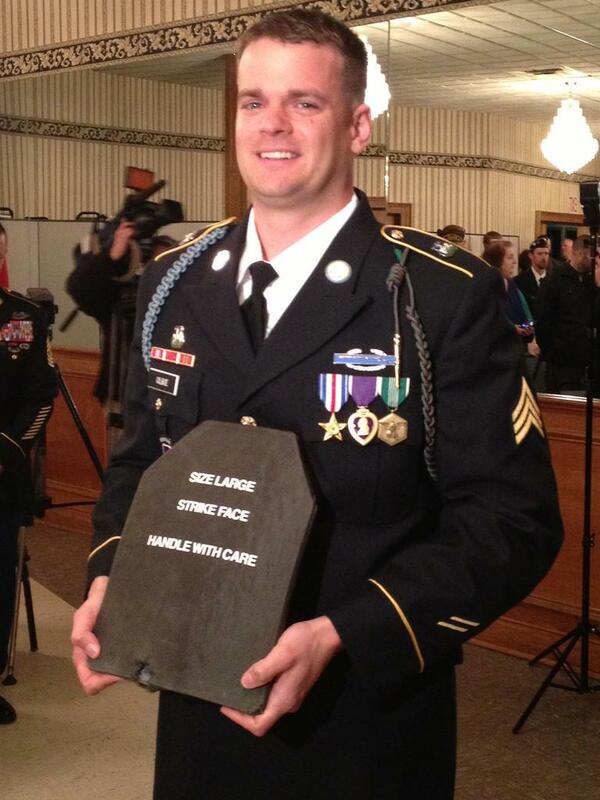 Timothy Gilboe of Westbrook, who was decorated for his actions in combat in April of 2011, received the armor plate from the U.S. Army at the Portland Veterans of Foreign Wars Hall, and shared his account of the attack that cost the life of a fellow soldier. Sgt. Timothy Gilboe said now, three years later, he thinks about the battle every day. "At first it was an obsession. It was an unhealthy obsession when I got back, for, like, a year," he said. Gilboe's unit was patrolling a small village in Afghanistan. As they walked up the backside of a nearby ridge, he said two enemy insurgents on a motorcycle fired on them. The unit returned fire, and saw what they thought were two men lying in the street. They walked down into the village to confirm. "And we swung around, we were on the backside of a house because they were in the middle of the street, and we swung around the house, around the corner, and at that point, we noticed that the bike was just laying there, and the two insurgents weren't there," he said. "So at that point, we kind of knew we were in trouble." Gilboe said as he started to walk around the front of a building in pursuit of the two men, his squad leader and good friend, 22-year-old Matthew Hermanson, put a hand on Gilboe's chest. "He said, 'Hey, stop. Get behind me, I'm gonna go first. Just stay with me.' And that was the last thing he ever said to me." Gilboe said Hermanson was fired upon and went down. A lieutenant charged in to help, and was shot in the leg. Then Gilboe saw flames coming out of an assistant gunner's backpack. Gilboe dropped his own machine gun and ripped the backpack off the gunner. "He was frozen, he kind of gave me this stare, like, there's something behind us that's really bad." ArmorGilboe said at that point, the two enemy insurgents ran out of the building, and straight at him. One of the two attackers was shot and killed, and Gilboe, unarmed, charged at the other and went for his gun. The insurgent fired, but the bullet was blocked by Gilboe's armor chest plate (right). "And at that point I had wrestled him to the ground, and I couldn't free the gun from him," he said, "so I jammed the AK-47 in his face and busted his face up. That caused him to let go." At that point, a fellow soldier shot and killed the attacker. Gilboe and other unit members rushed over to help and comfort the badly wounded unit leader Matthew Hermanson. "He won't call himself a hero, because it's really about his buddy, Hermanson, who we lost that day," said Command Sgt. Maj. Doug Maddi presented Gilboe his armor plate at the VFW Hall before a crowd of family, friends, and other veterans. "He is the next great American generation coming out of war. He's using his GI bill, he's going to school, things are bright. He fought where he was told to fought, and he fought well." Gilboe is now earning his associates degree in construction at Southern Maine Community College. And as much as he's ready to put what happened behind him, he said the armor, which he calls his battle buddy, helps tell the story of his other buddy who was a hero that day: Matthew Hermanson. "A lot of times you judge the success of your deployment by whether or not you brought your guys home. And in his dying moments, when he was passing, I can say for certain that he passed with a sense of ease, knowing that he had brought all of his guys home." Gilboe said the armor plate will always belong to his friend, who finished a champion.